Pick rocks out, rinse beans and place in pressure cooker with water and salt. Bring pressure cooker up to pressure on high; start timer 35-40 minutes. Let pressure release naturally (this can take another 15 minutes or so). When the pressure is all released open pressure cooker add oil and boil for 15 - 20 minutes so the juice thickens a bit. Dice onions, tomatoes, red and jalapeno peppers on medium heat add oil to frying pan saute all the all the diced veggies for 5 min, add about a cup of water depending on how soupy you want it and add the caldo de tomate or seasoning salt and boil for 7-10 minutes. 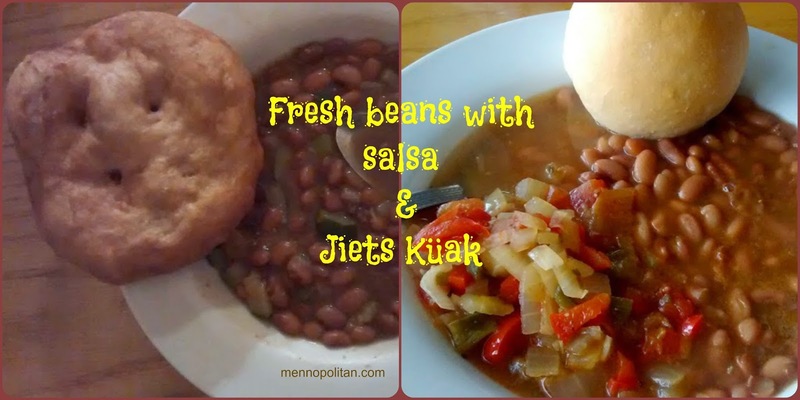 Serve the beans and salsa with a tweeback or a jiets küak. Click here for the tweeback dough recipe. To make a jiets küak take a raw tweeback, flatten, stretch, press some whole in it and deep fry it in vegetable oil until golden brown.